Find your home away from home in this elegant, yet cozy 5 bedroom paradise! This beautifully landscaped 3 story vacation home with a total of 2316 square feet has 5 bedrooms with 3 full bathrooms and is conveniently located near everything. It has a bright and airy feeling in every room. Live like a King in this spacious and private two story home. 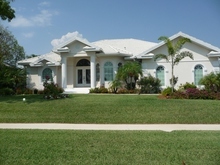 Southern exposure grand Estate residence is located on one of the rarely available premier lots on Marco Island. It offers spectacular views over the gulf and 10,000 Islands with direct access to the gulf. Enjoy the wildlife of dolphins, manatees and pelicans right in front of the house. Kick back and enjoy delightful Southwestern bay views and gorgeous sunsets in this newly upgraded 4 bedroom, 2 bathroom home! Extraordinary view, unlike any other on Marco Island! Take advantage of the direct access and unique wildlife this home has to offer. Incredible Private Outdoor Area, Close to the Beach & Shopping! Coastal contemporary style home in your very own piece of paradise! Incredible Extended Lanai & Pool Area with a Private Water Slide and Water Fall! Beautiful 3 bedroom, 2 bath, pool home just a short walk to the Gulf and Bonita Beach! Immaculate and substantially updated 3-bedroom, 2 bath, pool home on a private street within walking distance to beaches and shopping. Luxury 4th Floor Condo on Hideaway Beach, Just Look at the Water View! Discover the True Meaning of Comfort in this Direct Access Waterfront Home on Marco Island. Your Own Slice of Beach Paradise! Sit back and relax in this beautiful three bedroom two bath home located on the water on Marco Island. Marco Island. Magical. Mystical. Florida's tropical Paradise Coast and top vacation destination. Enjoy the luxury of Marco Island in this 3 bedroom 2 bath home with plenty of water view. Come and relax in this beautiful 2536 square foot home located on the water. Come enjoy the spectacular big water views on the confluence of two canals. This unique cul-de-sac home is beautifully landscaped with 140 ft. of waterfront combines convenience with plenty of privacy to unwind. Come Enjoy Naples in This Beautiful Lakefront Condo with Bundle Golf!